Email Signatures - What Makes a Good One? First impressions count and your email signature is no different. With over 500 billion emails sent every day, you need to make yours stand out! Think of your email signature as a digital business card. When you email someone, you should include your digital business card at the end of each email so that your brand, business and name are memorable. But not all email signatures are created equal. Could the poor quality design or lack of testing across major email clients be ultimately hurting your business, rather than helping it? Would you include a funny quote in your professional business card? Most likely not. Read on to find out how to create an amazing email signature design that will put your business above the rest. Sending and receiving email signatures to and from email clients like Outlook and Gmail, all have their own little quirks that we must deal with. Test your signatures across all major email clients to make sure it's looking it's best, like we do, or your signature may not be looking as professional as you think it does, when it arrives in your recipient's inbox. 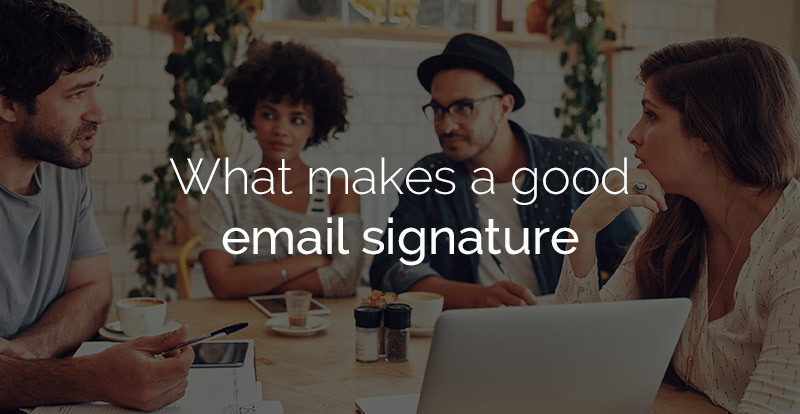 There's a lot more to email signatures that you think. From font choices, long legal disclaimers, to size of your images, find out more about common mistakes nearly everyone makes when creating their own email signature. Don't go overboard with information, only put in what is necessary. Remember it's an email signature, not a life story. Don't put any contact details that you don't use regularly. For example, if you're not in the office a lot, skip the office phone and just include your mobile. Remember, receiver's of your email signature will use the information provided to contact you. Use the same font throughout and definitely NO Comic Sans. Use only up to 2 colors, one base color like a grey or black and one brighter color that matches your business branding. Don't include personal quotes in a business email signature, unless you are a writer, or have an extremely good reason to do so. 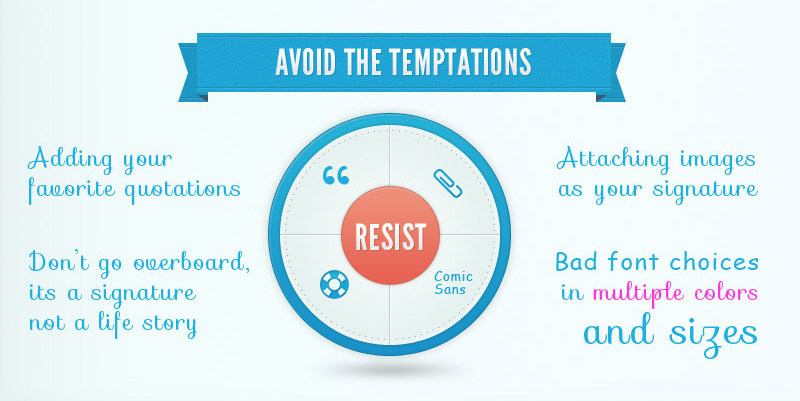 Check out our handy infographic on Pinterest.